Braving sub-zero temperatures and wearing gorilla and bird costumes, a group of New York City environmentalists rallied outside the headquarters of Rainforest Alliance last week, demanding an end to the organization’s certification of old-growth industrial logging. Rainforest Alliance was host to a ‘Green Leaders’ cocktail party and had prepared a statement repeating their position in favor of industrial logging of the worlds remaining old-growth forests. 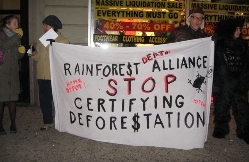 Environmental activists, including members of the New York Climate Action Group, engaged partygoers and passersby about the ‘greenwash’ of old-growth forest destruction by Rainforest Alliance SmartWood. Activists handed out hundreds of flyers and then proceeded into the building to speak with Rainforest Alliance spokeswoman and representatives of various environmental groups attending the cocktail party. “In the interest of public awareness of the controversy of industrial logging remaining forests we challenge Rainforest Alliance to debate these issues publicly!” said Michael Shenker of More! Gardens Coalition. A spokesperson for the the Rainforest Alliance agreed that their organisation would take part in a public discussion in which Rainforest Alliance certification of old-growth industrial logging was defended and challenged. Concluding the two-hour demonstration, the protestors said they were looking forward to the full public debate with SmartWood.